Firstly, there is the myth that oil “dries up” when it’s not moved around. If anything degrades oil, it’s oxygen. So the oil in our watch is exposed to that constantly, even when it’s waterproof, as there will be oxygen contained in the air inside the case. We have two scenarios. In the first one, the watch doesn’t run, the oil doesn’t move, and the oxygen will of course over time degrade the oil. In the second scenario, we keep the watch going, and the oil between the jewels and pinions will start moving as well, exposing more surface to the oxygen. So in my book, this will degrade the oil faster. The more important issue to me is wear. Any mechanical device that moves causes friction, and friction causes wear. You can have as much oil in there as you want to, you still have wear. And that will affect a fair amount of crucial parts. The balance staff pivots, all the wheel pivots, the barrel and barrel arbor, and, most importantly, the reverser wheels. Anyone with a vintage Rolex is aware that these don’t come cheap (usually around £100 a pop), and they do wear. You can see it on the tips of the little hooks that engage with the inner wheel. The older the watch, the more wear. Now will any of these parts wear if the watch isn’t worn and is in a drawer? No, they won’t. If you have ever purchased a NOS (new old stock) vintage watch, you know what I’m talking about. You open it up, and the oil might have degraded completely, but all mechanical parts are like brand new. No wear, and it’s like having a brand new watch movement. You clean everything, re-oil, and you have a watch like it just came out of the factory. On the other hand, if somebody would have put that NOS watch on an autowinder and left it there for 4 decades or so, there wouldn’t be much left of it. With a bit of luck, the abrasion would have eventually locked the mechanism up, preventing it from getting damaged even further, but it won’t be a pretty sight opening that watch and comparing it to a NOS watch that just sat in a drawer. I can see two scenarios where an autowinder might be in order. I have a vintage Rolex with the 1570 movement, which has no quick-set date. So if you put it to the side for 2 weeks, you have to go through 2 weeks of date changes to set it again. That is a sizeable pain in the backside, and having it on an autowinder if you wear it regularly will keep the date correct. Another useful application is of course in the workshop, where we use the autowinder to test every automatic watch before it leaves the workshop. Wonderfull! Thank you for writing this! It makes so much sense, I’m still amazed there’s any controversy about it. So it is very informative and very unique topic. I couldn’t agree more! But, the topic is very interesting. So, Thank you for sharing this topic. keep posting. I would like to add to this debate. I rapidly wore out the mainspring and barrel on an ETA 2824-2 based watch by wearing it whilst out running several times a week. That really gave the autowind a good work out! And of course when the mainspring is fully wound, further winding action is managed by the mainspring slipping in the barrel. By wearing the watch whilst out running, I clearly wore the spring and barrel out so that within 6 months it would no longer store a wind without a nasty slipping noise from the barrel and the watch stopping. Just bought my first automatic watch and was puzzling this question. Informative article and on the basis of this I won’t be buying an auto winder. Thanks, Christian. I just returned to mechanical watches after decades of wearing Quartz. I now have a couple of low cost Orients and Seikos. I was wondering about the need for a winder and you answered the question clearly and saved me some money. Looking at the winder vs no winder discussions reminds me of the never ending synthetic oil vs natural oil, Harley vs Goldwing, custom knife vs manufactured knife discussions. 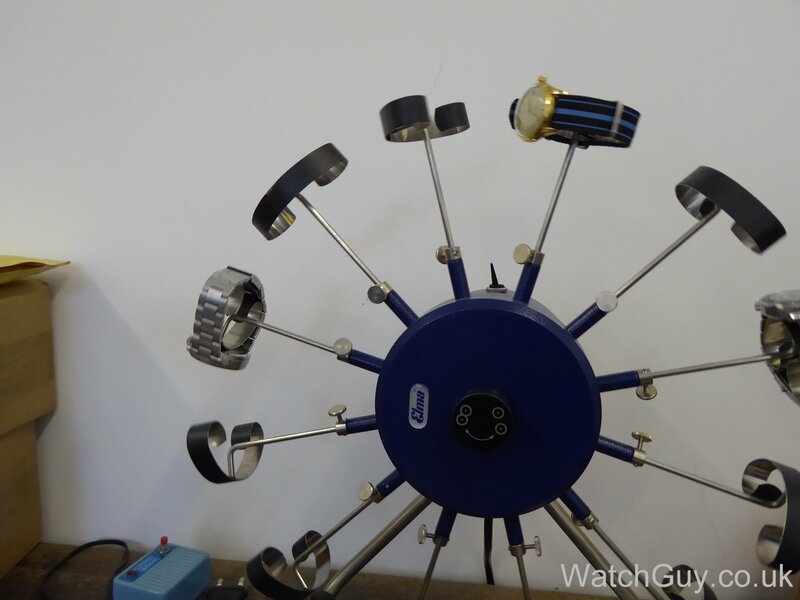 Pingback: Watch winder or manual adjustment? Why put your expensive automatic mechanical watch into a machine that runs off mains electricity, to keep it running ? Just buy a quartz battery watch ! Thank you. I read this just in time as I was about to buy an autowinder. 1. There is a belief that manual winding mechanism for an automatic watch is not as robust as it is for a winding a watch that is designed to be wound every day. Is it true? 2. Is it ok to wind automatic watches regularly? Will it wear out a watch faster? 3. I assume that when the automatic movement is in action, then manual winding mechanism gets disengaged is it true? 4. When we wind an automatic watch manually, does its automatic mechanism get disengaged? 1. That depends. On some movements, e.g. the ETA 2892A2, the manual winding mechanism is indestructible, with a very high gear ratio. You can’t break that for love nor money. 2. Why would you want to do that? The whole idea of an automatic watch is that you don’t have to wind it. If I put on an automatic watch, I give it a bit of manual winding, put it on the wrist, and forget about it. When I wear it, I never manually wind it. I don’t have to. Also, see 1. It depends on the movement if the manual winding mechanism is up to scratch or not. On most automatic watches, it’s just fine. 3. Yes. When the automatic winder is in action, the manual winding mechanism isn’t affected. Thank you for your prompt response and detailed clarification. My reply to your explanation in point 2. My day-to-day job doesn’t involve many hand movements. I sit in front of a computer and do a lot of typing and data analysis.Considering the cost of a Swiss watch, I handle it very carefully, so I don’t wear it when I do work around my house. If I don’t use auto-winder, the watch may stop at say 5 a.m. or over weekends. I have to adjust time each time it stops. I try to avoid manually winding an automatic watch regularly. To overcome this issue, I have been using an auto-winder with a minimum setting, which avoids the watch stopping in the middle of the night. Minimum setting on the auto-winder avoids a watch from unnecessary stresses, friction. You really have to change your lifestyle. I mean that. If you move so little that your watch doesn’t wind, you are in big trouble. My father at 87 didn’t manage to wind his watch any more by wearing it half a year before he died. So far, whoever didn’t manage to wind his watch by wearing it didn’t live for a lot longer. I have several watches with complications moon phase etc and I do use a winder for those as its such apita to reset them. My others I only set when I wear them. Thanks for the very informative post. Just a quick follow up question…do automatic watches need to be “broken in”? No, you just wear them. Certainly confirms what I have been told. The watch man I spoke to also pointed out the improvement of watch oils, so while watches have got better the oils have too. Also note only 21% of air is oxygen. Thanks Christian, that confirms what I’ve always thought and I don’t have a winder. Great to have a suspicion confirmed. That is interesting and good to know…. Agreed ! With hands and legs upz ! Thank you very much for this article, one of the best comments to this “evergreen”. You don’t let the engine of your vintage car turn when you are not out driving it either. Fresh oil or not. You have just saved me some money (and my watches) with your convincing argument. Thank you for writing this! It makes so much sense, I’m still amazed there’s any controversy about it.